Sre Kagabujandar who is the very first preceptor of the vast universe has been governing the earth from time immemorial (several millions of years). Since then, it was He who has been extending His able guidance to all the creatures living on the earth. 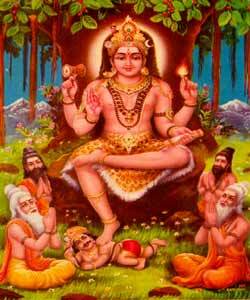 He, with Baguladevi has been guiding the Universe as father and mother. Thus Sre Kagabujandar may rightly be called the Supreme Preceptor of the Universe. Lord Umaamageswaran who governs the whole universe has created numerous Celestials ranging from the Trimurthis (Mummurthis) namely Brahma, Vishnu, and Shiva, Celestials numbering up to three hundred and thirty millions, forty eight thousand Sages, Ninety millions of Siddhas (a class of Celestials who have acquired eight mystic powers), Kinnarars, Kimburudars, Gaantharvars, Siththavithyatharars, Yakshas, Attathikku paalagas (a class of Celestials who governs eight directions of the Universe), Nine planets and Celestials who offer protection to other lives such as flies, ants etc numbering up to eighty eight thousand. Therefore Lord Umaamaheswaran created Sre Kagabujandar for the sole purpose of offering guidance regarding the past, present and future secrets to mankind. In order to execute the great work He was designed for, Sre Kagabujandar was blessed with an everlasting life. (c) Offer explanations regarding Divine secrets to the concerned persons at the proper time. Sre Kagabujandar who has been living in this Universe since ages (several millions of years) has imparted spiritual knowledge about the various Divine secrets (several millions of secrets) to several millions beings. Some of the Divine secrets were delivered directly to one of His best disciples namely Sre Gorakkar who resides in Kollimalai (His Abode). The Divine Life History of Sre Kagabujandar forms a part of the Divine secrets delivered to Sre Gorakkar. In order to fulfill His Divine Will He has created Me as the first Preceptor of this Entire Universe. Therefore, I want you to listen to Me, as I give a brief account of My Divine history. So saying, Sre Kagabujandar began to give a brief narration, by relating the Divine incidents that took place during the course of His Life. The first Mother of the Universe (Aadhiparaashakthi) existed even before the birth of the earth; She created Lord Brahma, Lord Vishnu and Lord Shiva in order to rule the earth with Her Mighty Powers. In order to assist The Trimurthis to carry out their respective tasks, She created Goddesses Saraswathi, Lakhshmi and Paarvathi as embodiments of the powers She possessed. Then She gave away Saraswathi in marriage to Lord Brahma, Lakhshmi in marriage to Lord Vishnu and Paarvathi in marriage to Lord Shiva. She entrusted the task of Creation to Lord Brahma, the task of Protection to Lord Vishnu and task of Destruction to Lord Shiva. Thus She united the Goddesses with their respective husbands (Lords) and commanded The Trimurthis to join with their respective consorts and devote themselves to the noble cause of ruling the earth. She (Aadhiparaashakthi) appointed Lord Shiva-the God with a third eye on His forehead as the Head of The Trimurthis and commanded Him to rule the world with Paarvathi. The task of creation set for Lord Brahma, Comes first. Lord Brahma could not get a clear vision about how to go about the task allotted to Him . So He looked at His consort Saraswathi and discussed the task of creation with her. During the course of their discussion, Lord Brahma said," How am I to proceed with this great work of creation? How am I to create the Celestials? I find myself completely at sea. Certainly, some one must offer Me ample guidance to enable Me to execute My task to the entire satisfaction of 'Aadhiparaashakthi'. What is the source on which I can depend to get the necessary guidance?" Lord Brahma pondered over these questions, but could not get an answer. So He told His consort Saraswathi that He was at His wit's end. Saraswathi who understood the intentions of Her Lord decided to put an end to the problem that troubled Him . She meditated on Lord 'Shiva' who is the head of the Trimurthis and did severe Penance in order to receive the necessary guidelines which would enable Lord Brahma to excel in the performance of the allotted task. Lord 'Umaamageswaran' who was moved and pleased by Her penance appeared before Her uttered the following words through His Holy Lips. "O Mother, I'm very pleased with your penance. I shall offer you a Holy male child who will stand as the first Preceptor of the Universe who shall be held in high esteem and will offer the necessary guidelines to enable your husband to execute His duties efficiently. I shall Bless Him with everlasting life. Receive the child!" So saying Lord 'Umaamageswaran' caused a ray of light to fall on Saraswathi's lap. My (Sre Kagabujandar's) body glittered with Heavenly Radiance which was gathered from the lights of thousands of brilliant Suns. My whole body was adorned with many ornaments. There were ear rings covered with amulets to ensure protection and a sacred chain on My neck (Ruthraatcham) as a mark of possessing spiritual powers. I possess four arms pointing upwards and four arms pointing downwards from each side of My body (the right and left sides). Thus there were eight hands on each side of My body, which accounted for a total of sixteen hands possessed. On each of My sixteen hands there were bracelets for ensuring everlasting life. Seated on a gold lotus, I (Sre Kagabujandar) incarnated as a Divine child with a Third Eye and I fell on Mother Saraswathi's lap. 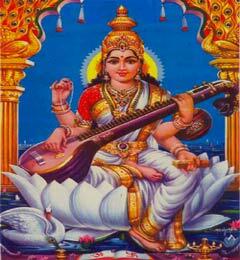 Thus, I was born to Goddess Saraswathi. The Trimurthis expressed their joy at seeing My Divine handsome figure adorned with ornaments by showering gold flowers on me. Being a Holy child they paid due respects to Me by bowing down their Heads to Me. On the four hands pointing upwards from the right side of My body, I held weapons designed for the purpose of attack and defence like a trident, (a three pronged weapon), a stylus for writing on a palm leaf, Divine Light, and an emblem of fearlessness. On the four hands pointing downwards from the right side of My body I held a Celestial cow named 'Kaamadenu', (that fulfils every wish) a lute, a Crow and a magical black pigment. On the four hands pointing upwards from the left side of My body, I held a spear, a club i.e. a symbol that confers a boon (one of the treasures of Lord Gubera) and a red Serpent.On the four hands pointing downwards from the left side of My body I held a Treatise, (a bundle of palm leaves) a sacred pot containing the favorite drink of Celestials which ensures everlasting life, a seal which represents the eight mystic powers possessed by Me and a magic wand. SRE KAGABUJANDAR SEATED ON THE "KARPAGAVIRUTCHA TREE"
I looked at the Celestial Cow (Kaamadenu), which seated herself on the palm of My hand. She created a Celestial Tree and earnestly requested Me to be seated on the tree and guide Creatures on this world. As desired by the Celestial Cow, from that day onwards, I used to sit on the Celestial Tree offer advice and guidance to the various creatures created by Lord Brahma such as Celestials, Sages, Siddhas, human beings, animals, birds and alike present in the fourteen worlds. I have been clarifying the doubts of the Trimurthis and I stand as the first Preceptor of this entire universe. Three hundred and thirty millions of Celestials, (Devas) forty eight thousand Sages, ninety millions of Siddhas (a class of Celestials who have acquired eight mystic powers), Kinnarars, Kimburudars, Gaantharvars, Siththavithyatharars, Yetchas, Attathikku paalagas (a class of Celestials who govern eight directions of the Universe), Nine planets, five elements of the Universe, five goddesses, and Protecting Gods of village limits have been receiving My advice in their different births and during different periods. Thus I'm a Divine immortal since several Ages and several kalpa periods. All kinds of spiritual education about Jurisprudence necessary to uphold truth and justice in the respective Yugandra periods, Vedas, Mantras, Sastras, Divine philosophies, Sixty four Divine arts and Traditional History of Gods have been imparted by Me and bestowed on the creatures with the Divine love of My Mother Goddess Saraswathi.I possess profound knowledge regarding the functioning of the Universe about the past, present and future periods. I entirely devoted all My time in offering guidance to creatures during a (one) Chathur Yuga Age (consisting of four yugas namely Kirutha Yuga, Thiretha Yuga, Dwaabara Yuga and Kali Yuga). 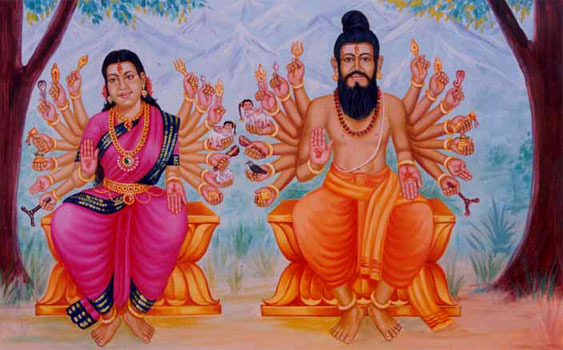 In the second Chathur Yuga age, in order to make strong foot-hold on courage and bravery to destroy injustice and uphold principles of Truth and Justice on earth, Sage Sambuga and His virtuous wife (the very embodiment of chastity) Kamalaakhshidevi together raised their minds to Lord Umaamaheswaran and engaged themselves in doing severe penance which prolonged for many years. Lord Umaamaheswaran who was very pleased with their penance appeared to them and Blessed them saying "O Son Born on penance! I appreciate and I hold you in high esteem for having devoted your time in meditating on me. Your wish shall be fulfilled. I' am offering a Holy child who is bound by My command and will ensure that all the creatures of Lord Brahma abide by the Law of Righteousness. Righteousness shall hold an everlasting place in the world. The Holy child whom I offer you shall ensure you all the benefits you expect of Her. She is a Divine immortal .I advice you to name the child Baguladevi and as proposed by Me earlier, She has to be given in marriage to Goddess Saraswathi's son Sre Kagabujandar (who has been living in the Universe since several millions of years and will continue to live in the ages to come) in order to fulfill your desire to the greatest extent possible". So saying,he caused a ray of light to fall on kamalaakhshi's lap. Sre Baguladevi's (my wife's) body glittered with Heavenly Radiance, which was gathered from the lights of thousands of Brilliant Moons. Her whole body was adorned with many ornaments. There were earrings covered with amulets to ensure protection and a sacred chain which was embedded with nine gems on Her neck. She possesses four arms pointing upwards and four arms pointing downwards from each side of Her body (the right and left sides).Thus there were eight hands on each side of Her body which accounted for a total of sixteen hands possessed. On each of Her sixteen hands there were bracelets for ensuring everlasting life. Seated on a gold lotus, She (My wife) incarnated as a Divine child with a Third Eye and She fell on Mother Kamalaakshidevi's lap. Thus, She was Born to kamalaakhshidevi. The Trimurthis expressed their joy at seeing Her Divine beautiful figure adorned with ornaments by showering gold flowers on her. Being a Holy child they paid due respects to Her by bowing down their Heads to Her. On the four hands pointing upwards from the right side of Her body, She held a spear, a club i.e. a symbol that confers a boon (one of the treasures of Lord Gubera) and a black Serpent. On the four hands pointing downwards from the right side of Her Body She held a Treatise, (a bundle of palm leaves) a sacred pot containing the favorite drink of Celestials which ensures everlasting life, a seal which represents the eight mystic powers possessed by Her and a magic wand. On the four hands pointing upwards from the left side of Her body, She held weapons designed for the purpose of attack and defence like a trident, (a three pronged weapon) a stylus for writing on a palm leaf, Divine Light and an emblem of fearlessness. On the four hands pointing downwards from the left side of Her body She held a Celestial Cow named 'Kaamadenu', (that fulfils every wish) a lute, a Swan and a magical black pigment. Sre Baguladevi worshipped the Holy Feet of Her Beloved Parents who were the cause of Her birth on this earth and received their Divine blessings. They were overcome by a Divine Bliss and surprised at seeing the beauty of Her Divine body. Sre Baguladevi then advised Her Father on the means to be adopted for destroying injustice. She disclosed complete secrets regarding the philosophy of bravery.Her beauty and spiritual knowledge grew by leaps and bounds day after day. One day My Mother (Goddess Saraswathi)who was eager to get Me married approached Me and asked Me whether there was any chance to get Me married. With the help of My great spiritual knowledge I came to understand that Sre Baguladevi was born as a daughter to Sage Sambuga as a fruit of His severe penance. So, I told My dear Mother that Sre Baguladevi will be My future wife and predicted the time when I'm to get married to Sre Baguladevi. My Mother Saraswathi whose joy knew no bounds invited the Trimurthis (Lords Brahma, Vishnu and Shiva) and their respective consorts and left for 'Sambugiri' (a mountain range in the Sre Kailash mountains) where Sage Sambuga resides and met Him in His Holy Residence. Goddess Saraswathi who came along with the large Celestial family,was accorded a very warm welcome by Sage Sambuga and His consort Kamalaakshidevi. Lord Vishnu who is one of the Trimurthis told them about the purpose of their visit. Sage Sambuga was very happy and gave His consent in getting His daughter married to Me. My sacred wedding was held at Lord Shiva's Divine assembly at Sre Kailash. All the Celestials were present on My wedding. They blessed us and we in turn Blessed them. It was My Mother (Saraswathi) who took the place of a priest and conducted My marriage, observing all religious austerities. SRE KAGABUJANDAR WITH HIS CONSORT SRE BAGULADEVI AS "THE SUPREME PRECEPTOR OF THE UNIVERSE"
After our marriage was over, Lord Umaamaheswaran and Umaamaheswari hugged us and kissed us on our spiritual eyes (third eye on the forehead) and Blessed the eyes in order to empower them. Since that day, I bear My wife Sre Baguladevi on My right side,sit on the 'Karpagavirutcha Tree' and govern the world showering Blessings on the creatures found on the earth. We (my wife and I) unite our powers in the form of Lord Shiva and Shakthi in order to gain supreme power. This supreme power enables us to exist in various forms as situation demands of us in different worlds (fourteen worlds) at the same time and guide creatures in their path through life. During the course of My life, which has crossed several millions of years, I had been to many places of pilgrimage, appeared to many creatures and We (My consort Sre Baguladevi and Myself) had Blessed them. I possess the unique power of being omnipresent in various forms, in various worlds (fourteen worlds) and govern the Universe. When people adore and worship Me, I Blessed them with the explanations regarding the secrets of the Celestials and all the fortunes for a happy life. If a soul adores and worships Me in any births, I shall bestow Him with the knowledge of all the Divine secrets and My Blessings will flow to Him from the Karpagavirutcha tree. Since, I assist souls in attaining salvation; I stand as the first Preceptor of the world. I am seated in the throne called "Agaara Beedam". With the letter 'A' as the basis the other letters function. With My seat on the throne of "Agaara Beedam" I bestow Guidance and Blessings on souls to lead a happy life when they act according to My advice. When Mahaapralaya (end of a kalpa-when destruction of worlds take place) takes place Lords Brahma and Vishnu take refuge under "Sre Kaayaaroganeswarar" who is the incarnation of Siva's Mahaapralaya.After the Mahaapralaya gets over, the Kirutha Yuga period comes into existence. 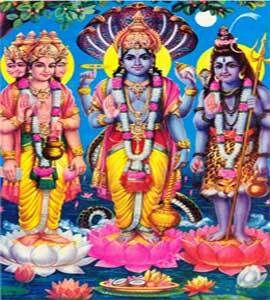 During this period, Lords Brahma and Vishnu come out of their refuge (hiding place) and emerge as supreme powers born from Aaadhiparaashakthi and rebirth of the consorts of the Trimurthis take place. In order to enable the Trimurthis and their consorts to understand the duties they have to perform, the Divine assembly will gather for a meeting. As per Lord Shiva's instructions I shall be invited as a chief guest. My wife and I will unite in the form of Shivashakthi instruct them (Trimurthis) on the duties they have to do, and we also inform them of the secrets of their previous births. When we instruct them, the Trimurthis and their consorts worship me, offer Me a seat in the "preceptor Beedam", as a mark of their abundant love for me. They sit under the seat which lies below the "preceptor Beedam" in order to pay heed to My Holy advice. While I offer advice to them, Lord Brahma takes the form of Brahmmabaalan; Lord Vishnu takes the form of Gopaalan and Lord Shiva takes the form of Bairavabaalan and delights them in listening to My Holy advice. After hearing My instructions they abide by My instructions. Lord Brahma will proceed with His duty of creation (creation of Celestials and other creatures). Lord Vishnu and Lord Shiva will rule the creations of Lord Brahmma. 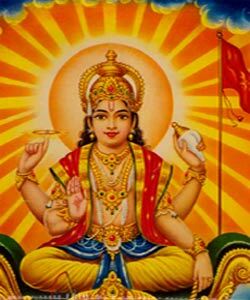 When Lord Brahma takes the form of Vedamurthi, the form which Brahma takes when He offers advice about Divine secrets, all the Celestials sit in their respective seats under Him, receive advice and act accordingly. In Sre Vaikundam where Lord Vishnu is the presiding God, Lord Vishnu takes the form of Krishnamurthi (the form that Vishnu takes when He offers advice about Divine secrets) all the Celestials sit in their respective seats under Him receive advice and act accordingly. In Sre Kailash where Lord Shiva is the presiding God, Lord Shiva takes the form of Dhakshanaamurthi (the form that Shiva takes when He offers advice about Divine secrets) all the Celestials sit in their respective seats under Him receive advice and act accordingly. Thus all the creations created with the blessings of Lord Brahma receive advice through any one of the Trimurthis, who are responsible for their birth. Thus through the forms taken by them nemely - Vedamurthi, Krishnamurthi and Dhakshanaamurthi advice is given to creatures and the earth is governed in an efficient manner. In a similar manner all the living creatures beginning from ants and flies which account to about eighty eight thousand kinds of living creatures, receive advice through any one of the forms of Trimurthis, who are responsible for their birth. During the 'Kirutha Yuga' which is the first period of the 'Chathur Yuga', creatures do not experience the impact of sins committed by them in their past births. They enjoy a happy life. They enjoy the liberty of enjoying and getting the best benefits out of life. In order to enable the creatures to live in an atmosphere of righteousness, God enriches the lives of the Celestials and other creatures by endowing them comforts and pleasures. After the 'Kirutha Yuga' draws to a close and the 'Thiretha Yuga' starts the deeds of the past birth decides the state of its present birth in the 'Thiretha Yuga'. Based on the deeds, God raises particular souls to greatness or brings it to ruin. Based on the deeds every living thing adores and worships the prescribed Celestials, Siddhas and Sages and receives advice through them directly or indirectly. Depending upon the quality of deeds the state of advice changes by sole to sole. Based on the quality and extent of the good deeds done a sole comes to possess its state of greatness on receiving Divine advice. Thus, Celestials, Siddhas and Sages guide living creatures that worship them with the framework of destiny. In a similar way, I stand as the First Preceptor of the Universe and offer My advice directly or indirectly to My disciples and keep the world going. It is many Ages since I have been extending My able guidance to millions of creatures such as Celestials, Siddhas, Sages, Yogis, Animals, Birds and Serpents, which include creatures with one sense to multiple senses. During My life which has crossed many kalpa periods (multi millions of years) I have seen many miracles in the Universe. Besides advising creatures on earth, I have advised millions of Celestial creatures too living in the remaining thirteen worlds of the Universe. Thus I have been extending My able administration throughout the whole length and breadth of the Universe. During the 'Kirutha Yuga' period, several times I have seen the earth existing with only one religion called as "Devamatham"(religion of Celestials). During the 'Thiretha Yuga' period, several times I have seen the earth existing with nine hundred religious differences. During the 'Thuvaabara Yuga' period, several times I have seen the earth existing with nine thousand religious differences. During the' Kali Yuga' period, several times I have seen men living in the midst of eighteen thousand religious differences. 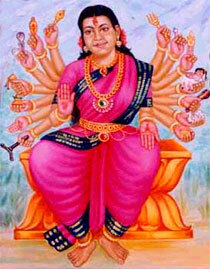 During different 'Chathur Yuga' periods, several times I have witnessed Celestials, Siddhas, Sages, Yogis, living things of eighty eight thousand kinds, incarnation of Gods, Divine histories, Divine philosophies, Vedas, and sixty four kinds of arts come into existence and then die away and then come into existence and thus the cycle of births and deaths repeats in single Unity with multiple Diversity on nature. During the course of My life I have seen several thousands of Mahaabhaarathaas, Ramayanas, Dhasaavadars, Raamas, Panjapaandavas, Suns, Moons, and Devendras. (Rulers of Divine assembly) During the course of My life, I have seen several Divine representatives in their successive births and I have discharged the rank of their birth to them and blessed them when I had met. All the matter mentioned above goes to prove that I 'The Supreme Preceptor of the Universe, stands as a light house that throws it's light on all things to seen on the surface of the sea and reveals the thing which acts as an obstruction to it and warns them of impending danger at sea as it sets sail on the sea, I stand as the Supreme Preceptor of the Universe exhibiting myself in different forms, in various worlds and guides souls on this vast Universe. Since, I bear a Crow in My hand, I' am named Kagabujandan. Since, I bear a snake in My hand, I' am named Naagabujandan. Since I bear a magic wand in My hand, I' am named Yogabujandan. Since, I have several Divine parts on My hands, I' am named Bujangan. Since, I extend My Divine help those who seek My helping hand, I' am named Bujandi. Eventhough I takes different forms on My life, the form of crow is favorite to me, so I' am named Kaakkayan. 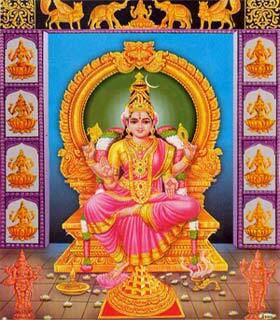 Since, I am Supreme Sage of all the serpents residing on Serpent world, I am named Naagenthramuni. Since I have advised Manu Science (sastra) of Justice to Sage Manu, I am named Manuvakkiyan. Since I understand the secrets of the past, present and future periods and offer the essence of real truths in the form of Amirtha to the creatures, I am named Kaalaamirthan. Since I' am endowed with the gift of everlasting life, I'am called an immortal Sage (Chiranjeevimuni). Since I reveal the past, present and future secrets of souls with the presence of black pigment on My hand, I am known as Anjanaamurthi. Since I sit on the 'karpagavirutcha tree' and by virtue of My ever growing supreme spiritual knowledge, I offer spiritual advice and since people who adhere to My advice derive all benefits in the form of a 'karpagavirutcha tree', I am known as Karpagavirutchan. Since I have the noble intention of doing only good to all creatures, I am known by the title Narbhavi. Since I extend My guidance to Lord Brahma, Lord Vishnu and Lord Shiva who stand as 'Brahma philosophy', I am known by name Brahmmaguru. Since I rank as the first and fore most Siddhar offer advice and extend My leadership over the Siddhas, I' am called the first Siddha (Aadhisiddhar). Since I stand as an immortal who has gained mastery over the past, present and future periods and have been successfully discharging My duties of guidance and bestowing blessings on the creatures, I' am called the master of all times (Thirikaalajeyar). Apart from this who worships Me as their preceptor in various other forms receive My blessings and guidance and live happily. I make use of My sixteen sacred hands to the greatest extent possible to guide and bestow blessings to the creatures. With My hand that holds a Trident (a three pronged weapon), I attack and defence the evil powers to bestow the creatures. With My hand that holds the stylus for writing I write spiritual knowledge on their tongues. With My hand that has the presence of Divine light I enlighten creatures by causing a Divine light to fall on them. With My hand that drives fearlessness, I dispel fear and assure protection to creatures. 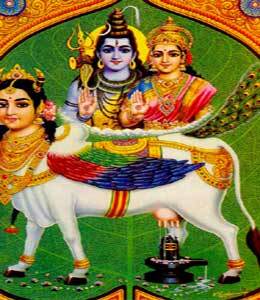 With My hand that holds the Celestial cow (Kaamadenu) with endow Me with innumerable wealth, I endow all kinds of prosperity in abundance to all the creatures. With My hand that holds the lute (veena), I impart knowledge regarding sixty-four Divine arts. With My hand that holds a Crow, I explain and advice the philosophies of love and unity to creatures. With My hand which has the presence of the magical black pigment (Anjanam), I advice creatures on the Divine secrets of the past, present and future periods. With My hand that holds a spear (Velaayutham), I endow great success to creatures. With My hand that holds the weapon 'Thandaayutham', (club) I punish those who throw a scandal on the blessings and guidance offered to creatures. With My hand that is capable of fulfilling the wishes of the people, I grant boon to creatures. With My hand that holds a red snake, I save creatures from the impact of sins and endow them with spiritual knowledge. With My hand that holds a Treatise (palm leaf), I impart all kinds of educations to the creatures. With My hand that holds a sacred pot containing the favorite drink of Celestials, ('Amirthakalasa') I ensure everlasting life to the creatures. With My hand that bears the emblem of the eight mystic powers possessed by me, I bestow creatures with eight mystic powers. With My hand that hold the magic wand, I advice creatures on the various methods of yoga. (Divine physical practice) In this way, I bear My consort Sre Baguladevi who is very embodiment of great power and discharge My sincere duty of offering guiding the creatures on My spiritual aspects and thus govern the Universe efficiently. Apart from the fourteen similar sacred hands possessed by My consort and myself, My consort has two different hands. With the hand holding the Swan, She discharges maternal affection to creatures. With the hand holding the black serpent, She blesses the creatures with salvation. My consort and I unite our powers in the form of Shiva Shakthi endow creatures with our blessings and guidance, and establish our role all over the Universe as a loving father and mother. (Powers of father and Mother rolled into one with father on the left side and Mother on the right side) Without receiving our guidance and blessings, creatures will not be able to get the great and complete blessings of the Almighty God. This is a great truth. "O My favorite disciple Sre Gorakkar! Since you have lent a patient ear to hear Me as I went on narrating the important events in My life while delivering My life history, you shall be endowed with all the sixteen kinds of wealth in plenty without fail at all times as bestowed on you by Me and My consort Sre Baguladevi united. Sre Kagabujandar's role found to be very great on Sri Ramacaritamanasa by Gosvami Thulasidas. Once upon a time during the early age of a Threda Yuga the Supreme Preceptor of the universe Sre Kagabujandar assumed the form of Crow and he disclosed the holy history of Sre Rama (The Lord Vishnu) to Sre Garuda at Manasa Lake (Manasarover) by first. This Divine message witnessed by Lord Shiva on His interview with his consort Goddess Shakthi there at Manasa Lake, the favourite abode of Celestial beings over the earth. Sre Rama chandramurthi�s holy history disclosed very first to the world by Sre Kagabujandar to Sre Garuda has been reproduced by Sre Tulsidas in an efficient manner in sacred poetry form. Sre Kagabujandar is ever protecting all the holy histories with him on one among his sacred hand in the form of Palm Leaves and the holy Treatise Ramayan is one among them. This holy view is ever seen at Sre Kagabujandar (Sre Kakabhusundi) Guru Temple placed at Sothiyambakkam - Pavoor village, near Kanchipuram. Introduction - The Presiding God of Sre Kagabujandar Guru Temple. The Supreme preceptor of the Universe Sre Kagabujandar the very incarnation and embodiment of the Supreme Shiva is undoubtedly the all powerful God Almighty Himself. He (Sre Kagabujandar) is the Supreme Preceptor of the Universe. The prime duty of the Supreme Preceptor, through the ages has been to impart spiritual knowledge and offer spiritual guidance to the divine Preceptor forms of Lord Shiva such as Vedamurthi alias Uthiramurthi - the divine Preceptor form of Lord Brahma, Krishnamurthi the divine preceptor form of Lord Vishnu and Gnanamurthi alias Dhakshanamurthi - the divine preceptor form of Lord Maheshwaran. The Supreme Preceptor who has been a unique spiritual teacher through the ages the worlds have passed by, will still continue with his divine venture (of offering spiritual guidance and imparting spiritual knowledge) in the ages to come. Thus He extends his everlasting supremacy over the worlds and rules them with Truth and Grace. The divine task undertaken by Him is of due importance as it lays emphasis on righteousness in all walks of life and helps promote peace and harmony for the survival of the worlds. The lofty seat of spiritual excellence is Sre Kailash-the heavenly abode of the Supreme Shiva. At an elevation of about sixteen million feet from this heavenly abode (Sre Kailash) is situated the Great Amrithalok- the loftiest seat of spiritual excellence. In this sacred and secret heavenly abode, Sre Kagabujandar displays His sacred, gigantic form. This sacred abode of Amrithalok could be accessible only by great souls. In this sacred place the divine Preceptor is found seated with his consort Sre Baguladevi to His right, under the Karpaga Vritcha tree and He is surrounded by a court, comprising of several millions of celestials and sages who are always at His Holy Command. It is indeed a breath taking sight to see the Supreme Preceptor (in His holy gigantic form) with his consort Sre Baguladevi to His right, bless the Universe with His unique sixteen graceful hands with all good fortune. Thus we see that the Supreme Preceptor occupies His divine seat at Amirthalok under the Karpagavirutcha Tree and extends his divine rule over all the fourteen worlds with his millions of celestials and sages always at His Holy Service. Ages ago, the holy sub-planets namely the 12 Rasimurthis, 27 Nakshatramurthis, 11 Karnamurthis and 27 Yogamurthis headed by Lord Shiva made their journey to Sre Kailash. Desirous of attaining everlasting life and establishing their everlasting rule over the worlds they (the holy sub-planets headed by Lord Shiva) flocked to Sre Kailash and expressed to the Supreme Shiva their boundless happiness at His direct divine rule and over lordship over the vast universe. Then, they begged the Supreme Shiva to grant them boons which would ensure them everlasting life and thereby enable them to establish their everlasting rule over the worlds under the over lordship of the supreme Shiva. They also added that they would be ever grateful and thankful to him if He would fulfill their wishes and enable them to rule the worlds under His divine supremacy. The Supreme Shiva, who had been lending a patient ear till then, thought for a while and then commanded the holy, sub-planets to abide by his divine conditions to help them acquire their boons. The Supreme Shiva in His extempore speech insisted that they (the holy sub-planets) should go to the ideal, holy place of Kanchi which ranks first among the other holy places for sanctity, righteousness and salvation. The very act of setting their holy feet on the sands of Kanchi would empower them. He also underlined the need of doing penance in this sacred place which is noted for sanctity, righteousness and for attaining salvation to enable them to acquire the boons they aspired for. According to the holy command of the Supreme Shiva, the holy planets should go to the Jothivanam, which lies in the southern celestial boundary of Sre Kanchi and to the north of The Holy river Cheyyar to do penance for acquiring boons. The celestials obeyed the holy command of the Supreme Shiva by going to Kanchi and doing penance at Jothivanam (Sothiyambakkam) which is an apt holy place in all respects. The Supreme Shiva's love for the celestials knew no bounds. His divine heart throbbed in His Breast when He came to understand the severe penance done by the celestials as a mark of respect and adoration for him.As an answer to the severe penance done by the celestials,He presented Himself at Sothiyambakkam in Kanchi as Sre Kagabujandar-the very embodiment of the Supreme Shiva.It was a marvelous sight to see the gigantic form of Sre Kagabujandar as He appeared on the earth with his consort Sre Baguladevi to His right and several millions of Celestials and Sages surrounding Him. The face of the Supreme Preceptor-Sre Kagabujandar was full of heavenly radiance and the whole celestial border was lit up with His radiance. Sre Kagabujandar at Sothiyambakkam-Pavoor (Near Kanchipuram). The Supreme Preceptor-Sre Kagabujandar appeared at Sothiyambakkam-Pavoor with His Consort Sre Baguladevi and His holy land of Celestials and Sages in the celestial boundary of Kanchi. His divine face shone with the heavenly radiance of several millions of suns. Words cannot describe to you the beauty and radiance of the Supreme Preceptor's gigantic holy form. As soon as the Supreme Preceptor made His divine appearance, the holy sub-planets flocked to him, knelt before Him and worshipped Him as a mark of their veneration for their Supreme Preceptor who was ready to fulfill their wishes. Sre Kagabujandar in turn, took Amrith from the celestial pot held in one of His divine hands and offered it to the sub-planets, blessed the sub-planets with His sixteen mighty hands, granted them the boons which would enable them to live an everlasting life and extend their everlasting rule over the worlds under the Supreme Preceptor's over lordship in the ages to come. The Supreme Preceptor had allotted a Naligai period (a measure of time consisting of 24 minutes according to the celestial calculation of time) to carry out His divine task of making His divine appearance with His consort Sre Baguladevi and His mighty, holy company of celestials and sages for the soul purpose of blessing the sub-planets and for granting them the boons they aspired for. Having completed His divine tasks the Supreme Preceptor with His consort Sre Baguladevi and millions of celestials and sages (who accompanied the Supreme Preceptor) left for the heavenly abode of Amrithalok. Just as one lamp lights another, Nobleness enkindles Nobleness. The same principle has found its application when the holy powers of the Supreme Preceptor, His consort Sre Baguladevi, the countless number of Celestials and Sages who were present on the holy occasion (when the preceptor blessed and granted boons to the holy sub-planets) transferred the holy powers to the existing holy powers of the sacred place of Kanchi and empowered and enlightened it (Sre Kanchi) to such an extent that every inch of the holy place of Sothiyambakkam-Pavoor was engulfed in sanctity and the air was filled with celestial fragrance. Thus we see, the great holy powers pervade the entire sacred place of Kanchi, with its main focus on the Celestial boundary called Sothiyambakkam-Pavoor. Since the inhabitants who lived in the Celestial boundary of Kanchi had seen the glittering holy form of Sre Kagabujandar glow with the light of several millions of Suns, the place was named Sothiyambakkam (Jothiyambakkam). Later the place within the Celestial boundary was split up into three different sub-urban areas in three different directions. The sacred place to the north was called by the holy name-Sothiyambakkam, the sacred place to the south was called by the holy name Pavoor, and the sacred place to the east was called by the holy name Bagavandapuram. Amazed at seeing the brilliant holy form of The Supreme Preceptor, the Celestials and Sages who were present at the holy occasion chanted Hymns in praise of the Lord and expressed their delight. So the place has another holy name Pavoor to its credit and the place lies to the south of the main village (Sothiyambakkam). Moreover, since many of the inhabitants of the surrounding area witnessed this heavenly, holy scene the place in the east of the main village (Sothiyambakkam) came to be called Parthargal (Parthangal). 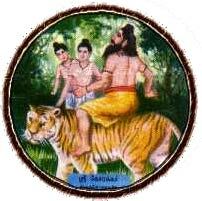 Atpresent Parthangal is known by the official name of Bagavandapuram. This is so because The Supreme Preceptor came to occupy His holy seat in this holy place since time immemorial. The appropriate place where the Supreme Preceptor made His holy appearance lies on the outskirts of Pavoor, The holy place was called Sothiyambakkam-Pavoor. Thus we see that the holy name of Pavoor was suffixed to it as the Supreme Preceptor had appeared at Pavoor. The place has another name Amirthalokh to its credit. This special name (Amirthalokh) speaks volumes of the greatness of the sacred place. Sre Kagabujandar and Sre Bhaaskharamaharishi. The Supreme Preceptor-Sre Kagabujandar exhibits His divine form and executes His divine work (Of imparting spiritual knowledge and offering spiritual guidance) through His disciples and thus establishes His over lordship over the entire Universe. Sre Kagabujandar displays only one-fourth of His holy mighty form, with only four divine hands in the sanctum-sanctorum in the rest of the temples devoted to Him (In the world). On the contrary, He exhibits His complete divine form with His sixteen gigantic hands only in this unique temple which lies within the Celestial boundary of Sre Kanchi. In perfect compliance with the holy will of Supreme Shiva and to execute His divine duties in a greater measure and to drive away all evil and to sow the seeds of spirituality in the hearts of men in this critical Kaliyugha period and to uphold the principles of truth and justice it could be aptly said that Sre Kagabujandar, the very incarnation and embodiment of the Supreme Shiva has come to occupy His holy seat for the sole purpose of saving mankind and other creatures from all natural clamities. Thus He could be rightly called as our saviour. In order to execute His duties to the last degree and as a first step of His holy plan aimed at promoting peace and harmony, He adopted a holy child who was born as incarnation christened Him with the holy name of 'Bhaaskharan' which is the holy name offered to the head of solar family-The Sun, and blessed Him with all good fortune. When He gained the grace of God as He attained the apt age to carryout His divine duties the holy title 'Guruji' was suffixed to His name. As days passed by, The holy child excelled in His divine services to the great Preceptor and proved His great devotion and executed all His divine works and services with such great fervor The Supreme Preceptor was immensely pleased, focused His holy attention on the holy child and looked up to him as one of the greatest disciples in the sands of time bestowed the holy title Maharishi and had it suffixed to the holy name of the child. Thus we see the burning love of the great preceptor for the child which drew his divine attention to Him (Sre Bhaaskharamaharishi) and the burning love of the Sre Bhaaskharamaharishi for the great preceptor which is set ablaze in His heart and never extinguishes, but glows more and more day after day. 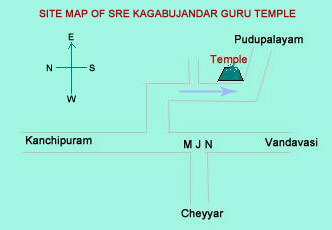 Special Features of Sre Kagabujandar Guru Temple. This sacred Temple is situated sixteen kilometers (16 K.M.) from the temple town of Kanchi on the Kanchipuram - Vandawashi route at the junction of the Mangal Kott Road (MJN - Mangal Junction Road) in the inner road that leads to Puduppalayam. 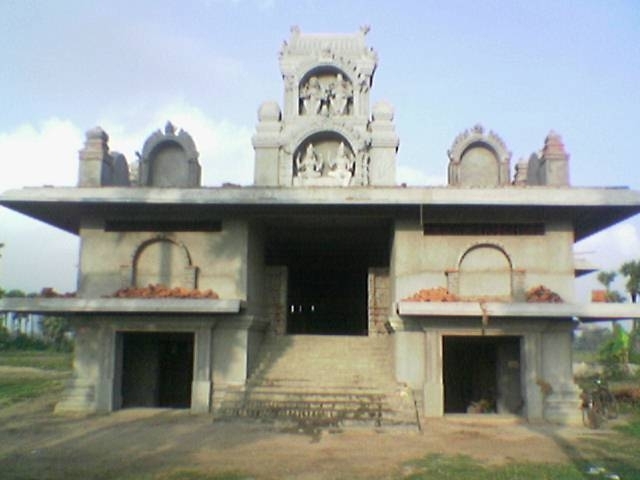 The holy place is aptly situated in strict accordance with the rules laid down by The Sre Kagabujandar Siddhar Sivagama Sastra and presents a unique and different Architectural skill. 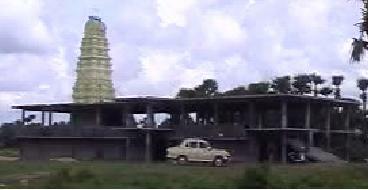 The main hall of the temple (Mandapam) adorns the very structure of the temple. On the tower of the sanctum sanctorum of the temple the figures of the divine creatures such as birds, animals and crawling creatures add their beauty and grace to the holy structure of the temple. A temple with such immense holy powers with sixteen steps could be accessible only by great souls who yearn for the divine blessings of the great preceptor who had witnessed many ages (Kalpa periods) since time immemorial. It is a fact that mankind can redeem millions of sins which mar their souls by offering Cows as a divine donation. The blemishes, disturbances and evils caused by all the nine Planets could be easily removed by worshipping the Presiding God and by enhancing remedial measures as prescribed by the spiritual teacher. This holy place could aptly be called- Sathyavirthashetra. Since it stands to reason, that all evils and defects which harass men could be completely removed through the divine faith of the devotees on the presiding God, it is note worthy holy place for salvation. This divine faith would go a long way in making the devotees adhere to the remedial measures for the removal of the blemishes and bring light into their lives. Sre Bhaaskharamaharishi, the Founder and Managing Trustee of Sre Kagabujandar Guru Temple has founded a Charitable Organisation named as "Sre Kagabujandar Charitable Foundation" in order to fulfill the object of construction and maintenance of Sre Kagabujandar Guru Temple. 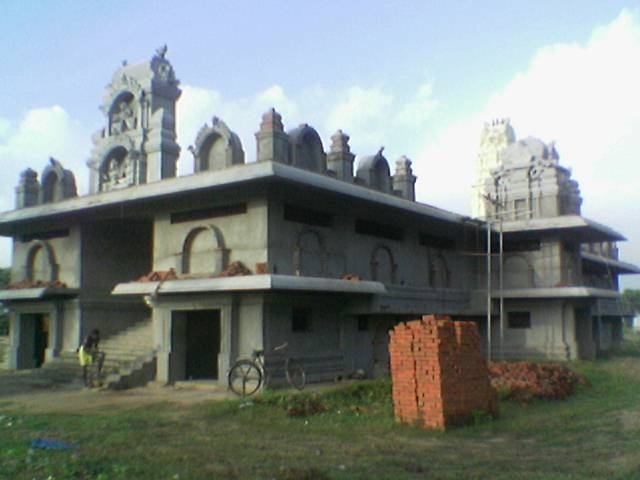 Now the construction activities of the Temple is in progress through the Charitable Foundation. The Kind Contributions from our belowed devotees are welcome inroder to fulfill the task of completion of the Temple works as designed and educated by "Sre Kagabujandar to Sre Bhaaskharamaharishi" inorder to perform another "Kumbabishegam (Purification ceremony)" as shortly as possible. The Beejatchara Moola Mantra helps to get full protection through the supreme divine graces of Sre Kagabujandar. The Karma siddhi moola mantra helps to attain earthly pleasures. The Gnaana siddhi moola mantra helps to attain spiritual knowledge. "Ohm Saramana Badhaguru Kasadara Vanamaya "
"Ohm Kleem Shreem Sre Baguladevi Swametha Sre Kaagabujanda Maharishi Biyom Namaha Namaha Vasiya Vasiya Sre Paathugaam Poojayaame Darpayaame"
"Gnaanaanantha Mayam Devam Nirmala Spadikaakruthim Aadhaaram Sarva Vidyaanaam Kaagabujandam Ubaasmahe"
The first Preceptor of the Universe namely Sre Kagabujandar has innumerable disciples to His credit. Among the disciples, Sre Gorakkar occupies a prime position and He is also a favorite disciple of the first Preceptor of the Universe. Sre Gorakkar rules Kollimalai. 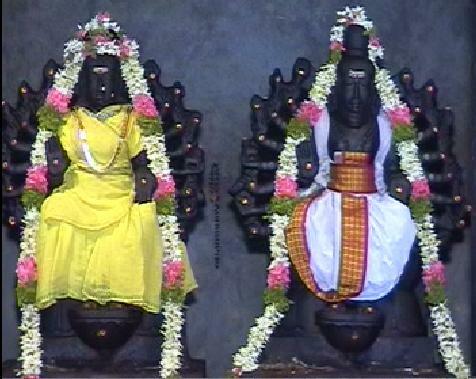 (Kollimalai placed in Namakkal district of Tamilnadu) He holds an outstanding place among the Siththa's. He prepared live medicines having longevity of several thousands of years to His credit. He possessed eight mystic powers in full shape. With opium (Kanja) as the basic herb, He was able to prepare medicines capable of curing diseases. Thus, the herb opium (Kanja) specially called as Gorakkar herb (mooli). He used His medicines for four kinds of human need namely Vaithyam (curing diseases), Vaatham (alchemistry), yogam (Divine physical practice) and gnaanam (spiritual knowledge) and imparted its full secrets to the world. Sage Agasthiya, (Agathiyar) the head of the Siddhas came to understand that Siddhas had written many Divine secrets on palm leaves in open status. So, He convened an assembly of Siddhas, gathered all the palm leaves on which they had written Divine secrets and instructed Sre Gorakkar to preserve them in an earthen pot. He also instructed Him to preserve the pot inside a rock. Sre Gorakkar did as He was instructed and He kept the Divine key of the pot with Him. That's why very few treatises written by Siddhas are in circulation in the present world. Sre Gorakkar has advised the secret of Divine key to Siddhas in order to enable them to see and read the Brahma Divine secrets of Siddhas. (Key here means the specific Divine mantras to be chanted to make the pot open by itself) Therefore, if a person seeks guidance and advice of the Preceptor must worship Sre Gorakkar to understand the true nature of the secrets. Sre Gorakkar who has been living in sacred abode at Kollimalai (Kolli hills) skillfully prepared several thousands of live medicines, Siddhar kuligais (Solidified Divine mercury) and palm leaves containing the Divine secrets. He then made seven separate boxes and kept the Divine materials with them. Ultimately, He buried the boxes in a secret place called Sre Gorakkar Gundam. "Ohm Kleem Sreem Sre Gorakkadevaaya Sarvasiddhar Anugrahaaya Devaaya Namaha"